My sister — Very High confidence — 4th-6th cousins. Myself — High confidence — 5th-8th cousins. My mom — Good confidence — 5th-8th cousins. My cousin (through my dad's sister) — No match reported. This seems strange, why would my sister be a much stronger match than my mom, unless either my mom is not a real match or we are connected through both my mom and my dad. Are there any DNA tools that allow you to better combine multiple DNA tests to better triangulate where a match is coming from? I've got all our tests copied over to both gedmatch.com and FamilyTreeDNA.com. Would either of these sites provide better tools for this case, or is there yet another site I should consider for such analysis? Your match combination to the individual makes sense actually. It indicates you have a match through your mother. 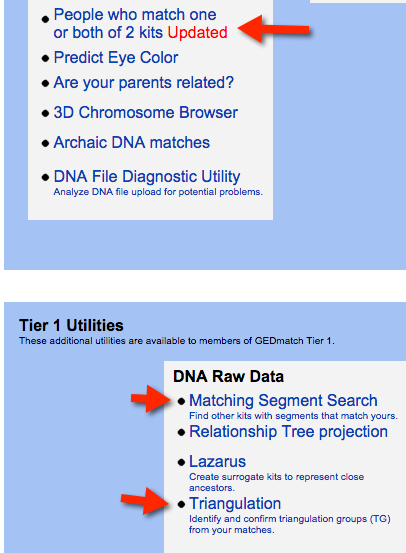 On FamilyTreeDNA and GEDMatch you may also see them as an X-Match (which only comes through the maternal line). The matching on Ancestry, and the generational ESTIMATE, is interesting but is truly only an estimate. I have seen this same result where I match stronger than my mother from someone clearly documented from my mother's side. I have heard various explanations for this, including there may be a secondary ancestor from my dad's side I may have picked up a few additional common chromosomes ... but that is just a theory. The passing of the chromosomes from parents is not 100% consistent and your sister (or you) may be passed a larger percentage from one of your parents than your siblings. 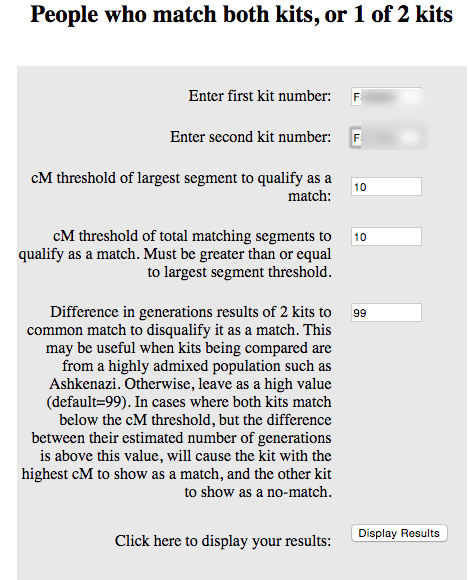 GEDMatch has great tools and some of the best out there, but your match needs to be on GEDMatch, and the BEST tools from GEDMatch are only available if you make a $10 donation for the month which allows multi-member triangulations and shared matches between multiple kits with detail. It takes about an hour to run (leaving your browser open) but you can run as many combinations as you want. These are their "Tier 1" tools and include "Triangulation", "Matching Segment Search", and "Lazaraus" (which is for reconstructing of a missing relatives profile). Available to all members too is the "People who match one or both of 2 kits". FamilyTreeDNA also has a good tool. It doesn't give you details like shared cMs in the immediate display but you can look it up afterward for each individual. You can compare up to 10 people at once and ask who matches all 10 of these people and it will give you a list of people and their level for each person (i.e. 3rd Cousin). I use it very regularly and the shared people in a line help me triangulate which side and which specific ancestor we share. 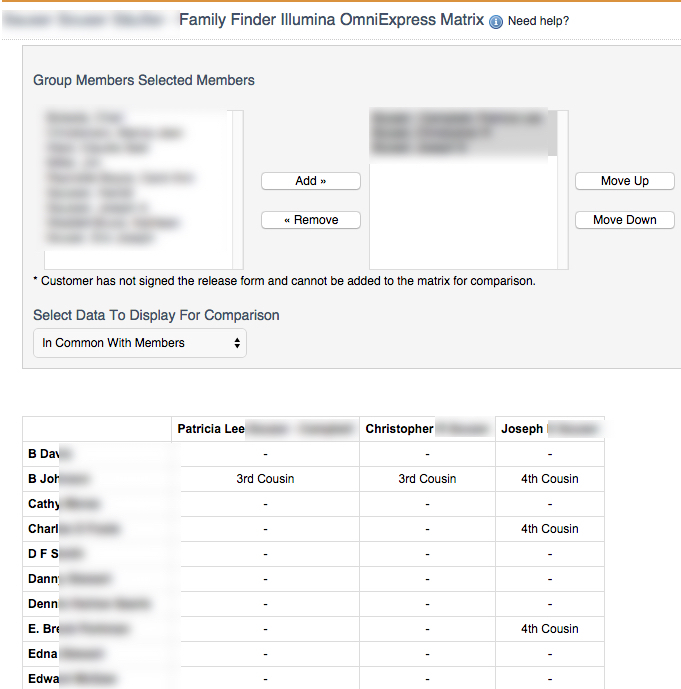 That tool is called the "FF Illumina OmniExpress Matrix" tool, choosing the "in Common with Members" option. Not the answer you're looking for? Browse other questions tagged dna ancestry.com or ask your own question. Is this DNA match likely to be a cousin or a half sibling? How does this cousin have NO relation to other cousin?